If you know of anyone at the Olympics, tell them to go find this place and bring back a dog! Hopefully they are able to rescue even more and find them loving homes. So awful that this has to take place, if only people neutered their pets and were responsible owners in the first place, you wouldn’t have packs of dogs roaming around. Warning: the video below describes some graphic imagery. So now that we’re all thoroughly sick and tired of winter, I’ve finally made my snow video of Finn! So I don’t have kids, just pets, humor me. This week is officially Finn’s anniversary of One Full Year in his Forever Home – with me and Steve. So I figured some kind of online recognition was required. So, you say… home inspection? Yikes! If you’re going to get a rescue dog by a reputable shelter, expect to have someone come to your home to do a in-home inspection. Reading other people’s blogs made it sound intimidating. Some people were turned down because they had left aspirin on their coffee table, or had wood stairs without carpeting. I bought child proof cabinet locks and did our attic stairs with strips of adhesive sandpaper. Works well! Some of the applications asked if we would crate the dog, or if we owned a crate (we were given one by my family) although I was never sure if they wanted you to crate or not to crate! I personally think that locking an animal in a crate all day is no way for it to spend it’s life. If the crate is left open and becomes a safe haven for the pet if it needs security, that’s a different matter. Turned out that Finn didn’t really care for the crate, he’d go in it at night because he was asked to, but would never enter it on his own. He will go to his dog bed and stay there happily, though. Most people sign up with a local shelter, get fully approved – application, reference check, phone interviews and house inspection. Then, once they’ve gotten approval, they’re at the top of the list to get a dog, and can get one right away. So we were doing it all wrong, since we were looking at the dogs, and then applying to all these different shelters. One shelter did say that if we were to pass a home inspection for a local shelter, that would suffice for them as well. Since the breeds we were trying for seemed kind of scarce we decided to keep doing it the way we were. We also learned that while the dog might be listed at adoptapet.com for say, Providence RI, you’ll see the same dog listed at Petfinder.com as being in Springfield MA, only to learn that the dog is still in Tennessee! They cross-reference the dog with different states and different shelters so that they can get more exposure. Your adoption fees help towards paying his transport, as well as medical care & shots, neutering, training and boarding. So when you add all that up, you’re really paying less than these things cost . You’re really getting a deal, especially compared to puppy stores, where here in CT you’ll find a “designer” breed (aka mutt) for about $1200.00! 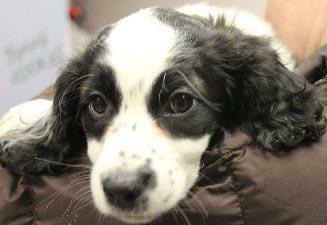 More on puppy mills and dog stores in an upcoming blog. A year ago this month I began my months-long search for another dog. We had lost our wonderful little cocker spaniel, Maxwell Highland, to cancer nearly six years before and Steve just hadn’t been ready to welcome another dog-child into our lives. He surprised me during our drive to my parent’s house for Christmas 2011 by saying that he wanted a dog. We decided that we would get a rescue dog. We filled out all the paperwork and waited. The name they had for her was Spot, and I’m thinking, “What kind of name is that for a girl?” I had decided to name her Bailey since to me she looked like a circus dog. Steve thought of Zuzu Bailey after one of his favorite movies, “It’s a Wonderful Life”. But as I would be bringing the dog to work and there’s a lab named Zoey who gets called Zozo I was thinking Zuzu was too close to that. We had a phone interview and some of our friends were called for references. Then after several weeks we were told that we were 4th in line for her, so most likely we wouldn’t get her but that they would keep us on file in case we saw another dog we liked there. 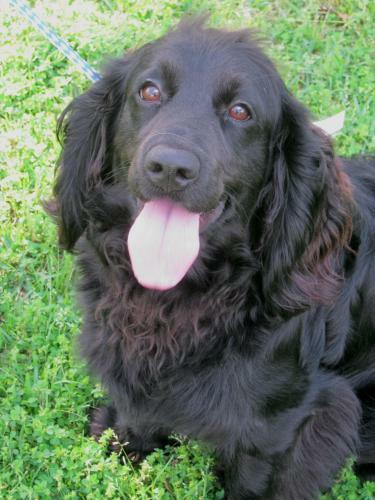 Next, we filled out forms for Earl the Boykin Spaniel. 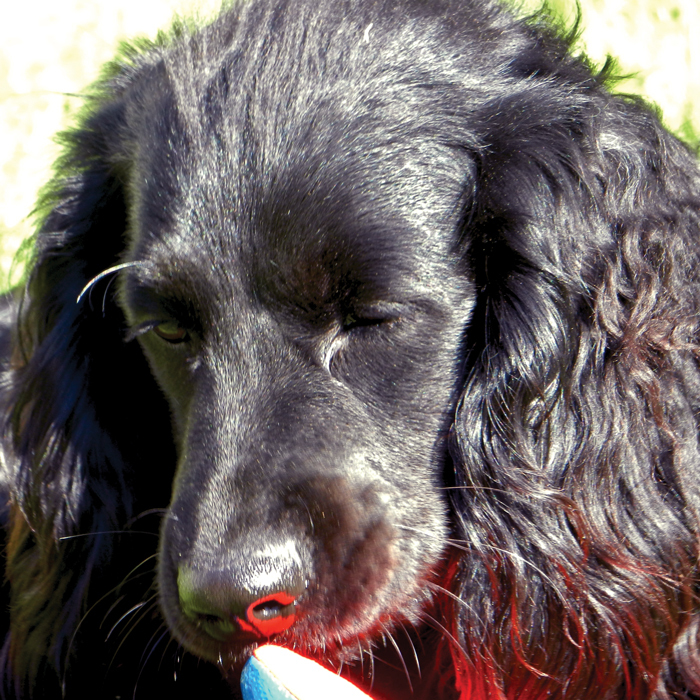 After reading up on several spaniel breeds we were most intrigued by Field Spaniels and Boykin Spaniels. 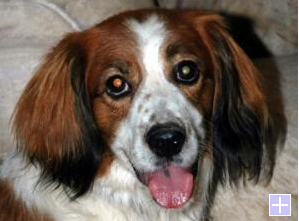 We wanted a dog that would be larger than a cocker spaniel but still have the same kind of spaniel cute floppy earred look and happy disposition. But we missed out on him as well. Then I saw a field spaniel in Florida who had a lung infection. He was scheduled to be put down because they didn’t want to infect other dogs in the kennel, so they said I needed to act fast as there was no way to reserve him at the shelter. I was able to secure transport for him the next day, but he had already been adopted by the time I called to arrange it all. I then tried for two more Boykins, one in South Carolina who ended up being afraid of men. The other was in North Carolina, but listed from a shelter in Ohio. That shelter couldn’t believe that New England has a shortage of dogs and was puzzled by the fact that I was willing to drive all the way there to get him. Boy, was this getting difficult! He had been down south and was being treated for Heartworm Disease and had been very ill. Again, after filling out all the paperwork and waiting for a few weeks we were told that he had gotten a great home. I was applying for only one dog at a time, as I thought that was only fair. I didn’t want to get a dog, and then mess up another dog’s chances of getting a great home by applying to more than one. Many of my friends couldn’t believe it took so long and that I kept missing out on the dogs. They urged me to just go to a pet store or a breeder but after learning about how many dogs get put down at shelters I just couldn’t. Then my friend Audrey called me about a dog that was in a local shelter. Her groomer told her about a cocker spaniel that she was asked to groom but it was so matted she told them it should get done by a veterinarian. Audrey and I went to see the little fella. He was rust and white, and true to cocker spaniels, he piddled from nerves when we said hello to him. Then he sniffed me, must have smelled the cats and the goats, sniffed Audrey and smelled her dog, and he decided we were okay. I spoke to the woman at the town hall about getting him, only to find out that I was again, 4th in line. They had to keep the dog for several weeks since he was a stray before they could let him go to an adopted home. So finally after four months of searching I saw a dog that had just been listed as he hadn’t been on the site that morning, and he looked exactly like what we wanted! 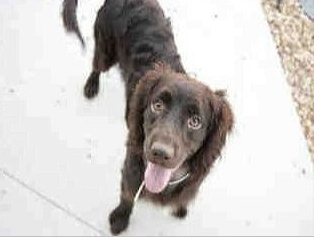 They listed him as a black cocker spaniel/field spaniel cross, about 1 1/2 years old. I ran to the living room and shouted to my husband, “I found our dog!” And he was like, “Yeah, like you haven’t said that 8 times already.” But I showed Steve the listing, he liked the pics and I filled out yet another hour-long form and sent it off. It turned out that the rescue organization was only about 10 miles from our house. It was the American Lab Rescue, and I had a friend who had a contact there whom I had emailed in December, but as they mostly did Labs, I didn’t expect that we’d get a dog from them. So I sent my contact an email and she promised to help if she could. Our references were called, we were called by one of their people, then Finn’s foster mom spoke with us to see if we were a good match for the dog. 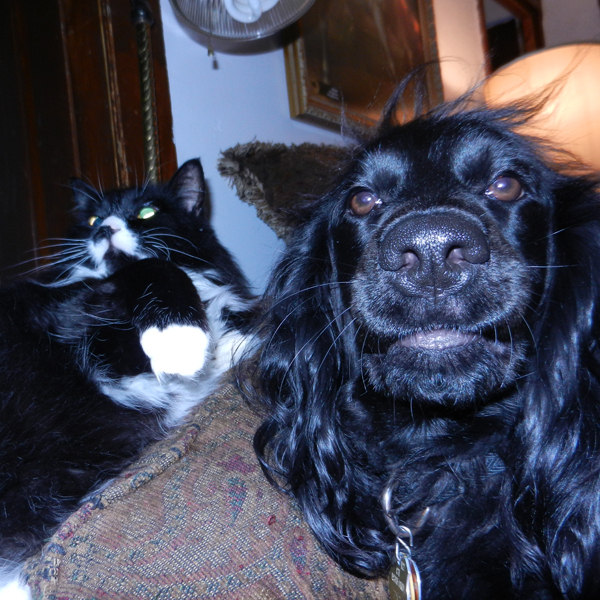 Then the dog had to go through what I decided to call the “cat scan”, to see how he reacted to being with cats, since we have three. 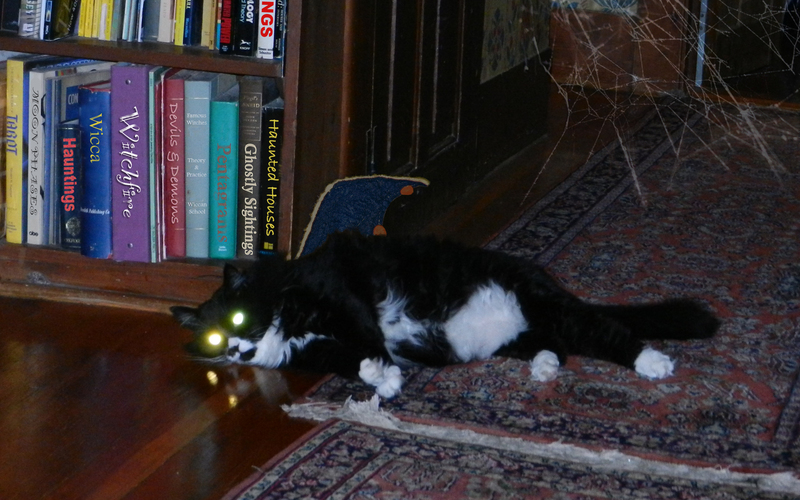 We were told he hid behind the humans when the cat hissed at him, so he passed. He was still in Alabama, so once we passed the home inspection he was cleared to ship up to Connecticut to us! We paid for him via paypal and saw that the tranport company would send us updates to a website where we could keep track of his 2 day journey. These transports are amazing by the way – check it out. Then, the day before Finn was to arrive, Audrey calls me to say that the little cocker was back at the shelter. The people who had gotten him let him LOOSE on purpose, near the shelter. The lady from the town hall called them to see if the dog got loose by mistake, only to hear the people say that they didn’t want him since he wasn’t potty trained! I couldn’t believe that anyone would let a dog loose on a 4 lane highway! They could have just brought him back to the shelter and if they didn’t want him. At least he wasn’t hurt. The lady at the town hall remembered talking with me and she thought I’d give the dog a good home, but as Finn was already on his way, I had to say no. I hope that he got a good home. 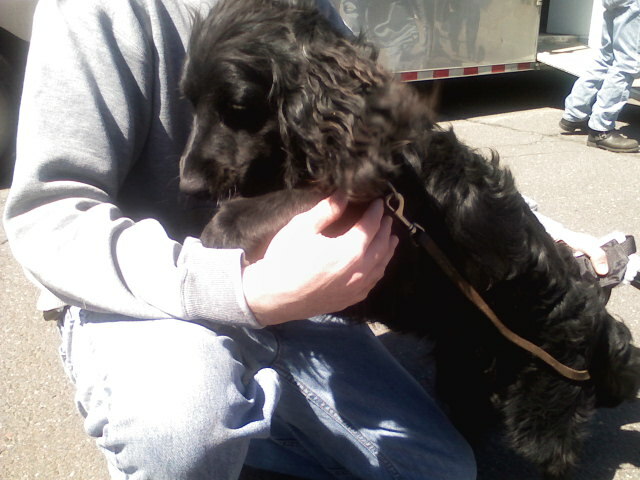 So here’s the first pic of Finn when we got him off the transport: he ran into Steve’s arms and into his lap for a hug. It was as if he was saying, “I’m yours, take me home.” Finn has been part of our family since Easter weekend, and from the start he acted as if he’d always been here. He takes things in stride, loves everything and everyone. We didn’t even know he could bark until he wanted to play with Zoey at work! I expected a rescue dog to have issues with trust or attachment or some kind of training problem, but we really got lucky. He is amazing and it breaks my heart to see that there are so many dogs in shelters that don’t get rescued and end up with their lives cut short. We were told that Finn had only one more day to go before being put down but the ALR organization came in and saved him.